Los Angeles, CA (December 9, 2011) – Latino Public Broadcasting (LPB), a non-profit organization funded by the Corporation for Public Broadcasting, announces 16 newly funded programs as part of its 2011 Public Media Content Fund. The funding initiative invites independent producers to submit proposals for funding on Latino-themed programs or series.“We are proud of Latino filmmakers and producers who through their craft provide a window to our culture and heritage,” said Edward James Olmos, LPB Chairman. “We are very excited to support these projects that celebrate the diversity of the Latino experience in the U.S. We will work closely with PBS and our public media partners to bring these compelling stories to the American Public,” said Sandie Viquez Pedlow, LPB Executive Director. This year, sixteen (16) proposals were selected for funding. Emerging filmmakers comprise 40% of total funded producers; mid-level producers make up 35%; veteran filmmakers constitute 25%; and 55% of the funded producers are women. More than half of the awarded programs have never been funded by Latino Public Broadcasting before – a direct result of an extensive outreach program for independent filmmakers throughout the nation. One of the grants goes to The Arizona Project by Producers/Directors: Carlos Sandoval/Catherine Tambini. Carlos bough his American Experience documentary, A Class Apart to VideoFest in 2009. Kat Chandler’s New Short in Sundance! Congratulations from all of us at Video Association of Dallas! We adore you! While listening to an NPR report on a book by Craig Marks and Rob Tannenbaum, I Want My MTV, I was reminded of the term “The MTV Effect,” referring the effect video editing has had on modern movie making i.e. 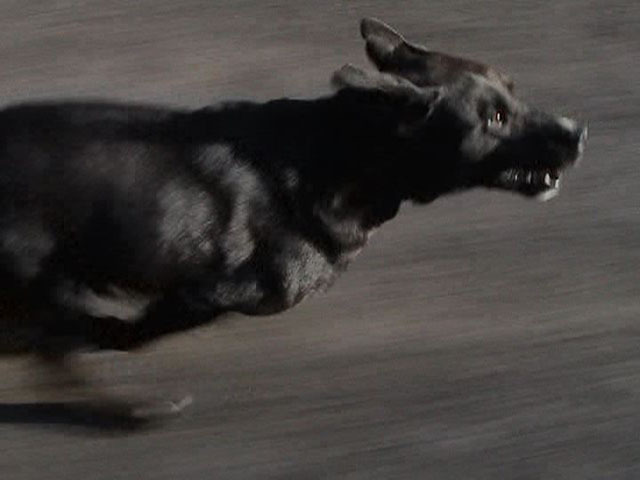 multiple plotlines, jump cuts, free use of visual effects. It is refreshing to see a distinguished filmmaker like Darren Aronofsky still able to utilize these techniques so effectively in his recent video, “The View.” Even if the Lou Reed/ Metallica collaboration fell short of expectations, the video itself is uncompromising and stunning. I learn many fascinating things about Iva over our brunch in the East Village such as she immigrated from to NYC from Yugoslavia via Cyprus, she spends time every year in the southwest, and she thought she might have lost her eyesight for two terrifying months. Iva is as delightful and creative as her work as you can see from the interview she granted in Thompson Square Park. You can check out her website and her blog for more information. The wonderful thing about NYC is that you can experience so many different kinds of environments. This uncharacteristically sunning November afternoon I catch up with Lynne Sachs, who has had work screened at the last two VideoFest. I complement her on her beautiful website and we talk the use of text and media and history in her work. 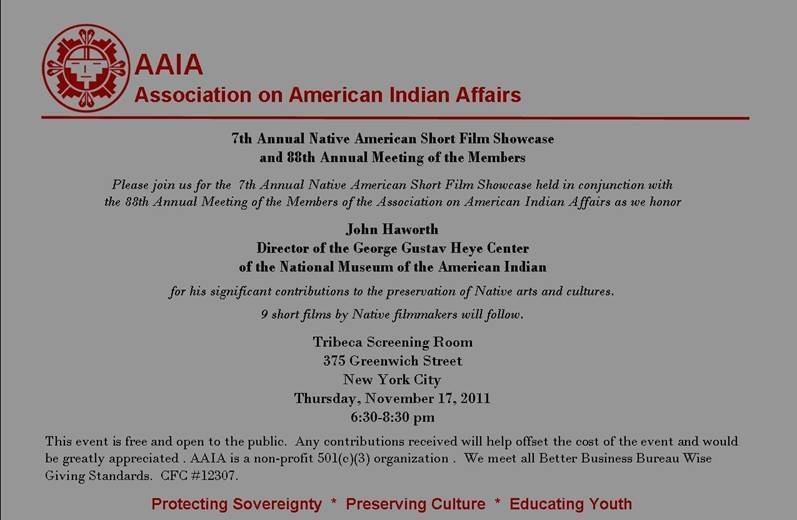 I just got back from my annual trip to NYC, where, for 6 years I go in November to screen a program of Native shorts for the Association of Indian Affairs. AAIA’s initiatives focus on youth/education, language and cultural preservation, and sovereignty. I was happy to once again be able to showcase 9 short films by Native American filmmakers and share with you a little of what AAIA does and how we help Native American communities. Check out one of the works, the Growing Native trailer, here. The trip to New York was great, as I was able to catch up some of the filmmakers who have contributed to Dallas VideoFest, as well as get a tour of the Museum of Television and Radio, by our valued contributor Ron Simon. One free evening I attended the Tour of Resistance Solidarity Gathering, where is witnessed an incredible performance by Tama Waipara. While I was gone Bart was profiled in NAMAC’s regional report, and I learned about a new website Virtual Dinner Guest. Have a good week all. Interviews to come. Tom Kalin is a New York-based filmmaker, writer, producer and activist, well known as a prominent figure in the New Queer Cinema. In addition to his feature films Swoon (1992) and Savage Grace (2007), Tom Kalin has also created short films and video works screened in numerous international film festivals and included in the permanent collections of Centre George Pompidou, Paris and MOMA, New York. He was a founding member of AIDS activist collective Gran Fury, known for its provocative public art projects, which received The Brendan Gill Prize in 1989 and was included in the Venice Biennial in 1991. His works traverse diverse forms and genres, taking inspiration from literary sources and addressing contemporary issues such as displacement, urban isolation, and homophobia. Tom Kalin focuses on the portrayal of gay sexuality and has done a significant work in changing the public opinion of AIDS, simultaneously expanding the definition of activist video. Doveman is a band founded by 30-year old Thomas Bartlett. Originally from Vermont, Bartlett studied piano in London with Maria Curcio before moving to New York City to attend Columbia University. Bartlett collaborates with artists such as Glen Hansard, The National, Martha Wainwright, Antony and the Johnsons, David Byrne, Bebel Gilberto, Rufus Wainwright and Yoko Ono. Albums include With My Left Hand I Raise The Dead, Footloose, The Acrobat and The Conformist. This ongoing collaboration between musician Thomas Bartlett (Doveman) and filmmaker Tom Kalin started as a series of short films inspired by Doveman’s music. Our project has begun to explore the intersection of live music and projected film. Every Wandering Cloud is the first installment in a series of experimental videos inspired by the writings of Oscar Wilde. Interweaving text from Wilde’s The Ballad of Reading Gaol with hand-drawn animation derived from Eadweard Muybridge’s Human and Animal Location, Every Wandering Cloud is a meditation on themes of freedom and imprisonment. The tape juxtaposes an eclectic array of archival and contemporary imagery, including documentary footage and my original super-8 and digital video. Girl in a Coma, a San Antonio based rock band shot their latest and greatest Music Video, “Smart” on Super 8. They used all Pro8mm workflows including the Max1014 xls camera, Super8/66 B&W Tri-X Reversal and Pro8/46 Fuji Vivid 250D film, and transfered on the M2, Check out their final music video!